Anyone who has flown knows that it’s hard to fly without having layovers. I’ve had lots of layovers through the years. I have spent the night asleep on the floor of an airport in Vancouver when I didn’t get a standby flight to Prince Rupert and 7 hours grounded in the St. John’s airport when a pilot accidentally hit the brakes before take-off. I’ve had so many layovers at Halifax airport that I have a favourite bathroom there. But I’ve never liked layovers. Usually they are a total pain. They are boring and tedious and, if I can avoid them, I always do. It is just so much easier to go from Point A to Point B without having to stop on the way. I feel the same way about what I call “life layovers” as well – those seasons when you are between one thing and the next, and there’s not much to do but wait. 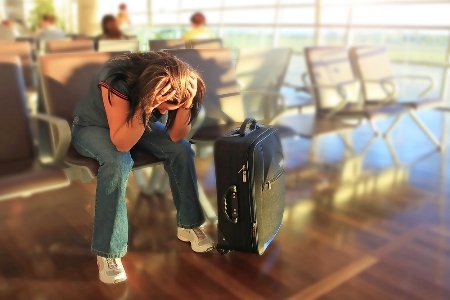 Life Layovers happen to us all the time. They happen between finishing school and finding the right job. Or when you have moved to a new place and you haven’t settled in. They happen when we are sick or when we are grieving. They are the times that we have left things as they once were…but we’re not at the next thing yet either. Sometimes we don’t even know if there WILL be a next thing, or what that next thing might be. We are in between, and what we would most like to happen is to have it all end quickly. We want to get on to the next thing. We want to get out of the in between place that is tricky and uncertain and into certainty and comfort and whatever we think should happen next. There is actually a real word for these seasons of life. They are called “Liminal Spaces.” Liminal comes from the latin work “limens” which means “threshold.” Liminal Spaces are like life layovers. Liminal spaces are very real, and they are often hard. In the Bible there are many stories of people who find themselves in Liminal spaces. The liminal spaces in the Bible include pits, graves, jails, desert, wilderness, seas, and whale bellies. There is story after story of people that God loved finding themselves “in between” the things that once were and the things that will, eventually, be. One interesting liminal space in the Bible involves an entire nation. It is a popular story. The Israelites, the people of God, had been living as slaves in Egypt for hundreds of years when God sent them a leader to take them out and bring them to freedom – to the promised land. The Pharoh (or king) of Egypt lets them go, only to change his mind and chase after them. This brings us to a pretty intense scene. The Israelites find themselves with the Red Sea in front of them and the army of Pharoh right behind them. They were literally between the army and the sea. Now THAT is a liminal space! Their liminal space was scary. It was so scary that they figured going back to the old way – even if it involved being slaves – would be better than going forward. I get it. How could anything good be on the other side, when the only thing in front of them was a whole sea of water??? Yup, I can totally read that every single time I brush my teeth. Making good on his promise, God then parts the sea in two, and they do the impossible and walk on dry ground to safety and freedom on the other side – and end up a little closer to the promised land. It’s hard to be stuck in liminal spaces. “Before” or “After” can seem much more enticing than “middle,” especially when we don’t know what is on the other side of the sea. It can certainly be hard to be “still” in those spaces, and recognize that God is not just the God of “before” or “after” but that God is also God of the liminal. In fact, the liminal space is usually the exact space God needs us to be. You can’t get from St. John’s to Vancouver without a layover in Toronto, or Calgary, or Halifax. But the layover isn’t there to drive us crazy. It’s there to get us where we need to go. It’s one of the most important parts of the trip.